The temple is beautiful, but a lot of money has been invested. @Nevena83 It's worth it, and I was convinced myself. It was done well and the expensive material was used ... not to mention how big a temple is. Did you have the opportunity to see him live when you might come to Belgrade? @LowRiderX I do not know if it's worth it when there are so many hungry and sick children. Yes, I was in it a few years ago while it was still being renovated. @Nevena83 Oh Nevena, please, there have always been and will always be sick and hungry, if everyone would think like that, we would live in ruins. Should we leave the demolished buildings from bombing in the city center? It is not a problem, the idea of building the Temple came to an end in the 19th century, it began to be built in 1935 but was interrupted due to the Second World War. In 1958 after 88 applications and the same number of refusals finally in 1984, a license was granted to continue the work. It was again stopped during the breakup of old Yugoslavia, it was continued in 2000 again. And it's still not finished interior - that's the problem. The shape reminds the Santa Sofia in Istanbul. This is a beautiful Temple. @LadyDuck You are in right! According to the original solution, would have a different appearance. The suggestion was that these church would 'accept' three religions, Orthodox, Catholics and Muslims. Imagined construction as Gracanica. A lot of engineers and architects worked on the changes. A new solution, which was no longer under the influence of Gracanica, was already emerging, but the Church of Saint Sophia in Constantinople (Istanbul) was the new model. @LowRiderX Also the Church of Saint Sophia hosted different religions during the centuries. Those are really big Temples and beautiful. That is an exceptionally beautiful church. I love the architecture and the fountain, too. So glad you and the girls had a fun day. @DianneN A lot of money has been invested, it's really well done It is a magnificent building, which every tourist should see and it is very difficult to describe it by words, even with pictures, how impressively it looks and the positive energy itself is in and around him. @LowRiderX Did you hear that Notre Dame in Paris is on fire? It's all over the news. I am horrified over this! The church looks very beautiful. I am glad you had a good time even though the weather wasn't perfect. @LowRiderX I can imagine that it is even more impressive when you visit it in person. I never got the chance to see much of Serbia. I changed trains in Belgrade once, but I wasn't able to do visit any places. Hopefully I will get the chance to do that another time. how very beautiful. thank you for sharing these beautiful sites from your country and the info you are giving. Nice photos. I never been in Belgrade but maybe I visit it soon. @LowRiderX My brother was few time in town. I will ask him did he was in Temple. Gorgeous pictures. The inside is amazing. @simone10 Yes, it's beautiful, it's pretty much invested, so the result is the way it is ... beautiful !! @LowRiderX I would just be in awe if I were to walk inside. The temple looks beautiful, glad you enjoyed your time besides the weather. @LowRiderX Yes, sometimes we need a break, it is good for us. @LowRiderX I liked this kind of stuff. Wow these photos are stunning. @LowRiderX And you did, great collage. Lovely collage you have there. The church is very beautiful. I'm please you had a great time despite the weather. @LowRiderX That's good to hear. I'll look forward to more posts. That is a lovely building. Even the weather can't spoil its beauty. 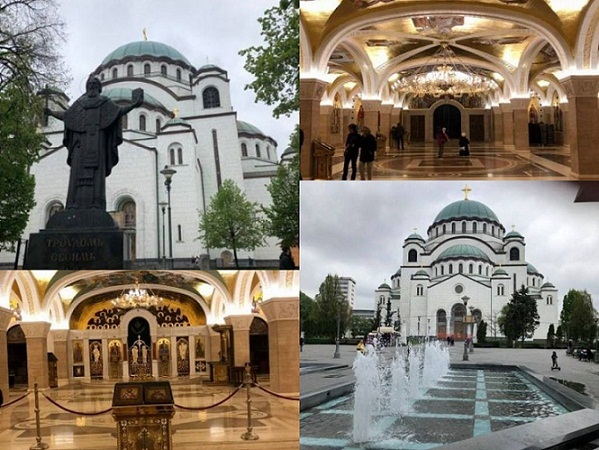 @nomus24g 5th place of the largest Orthodox church in the world is proudly occupied by the Temple of Saint Sava. We have a lot of beautiful buildings. That church looks so beautiful . @jstory07 Yes, but it is much more beautiful when viewed live, and the positive energy that rules around the Temple and in the Temple is hard to explain incredible.. I'm glad you had an enjoyable visit to the temple. Lovely collage. I'm sorry the weather wasn't cooperative. Wow that's one amazingly beautiful looking church.